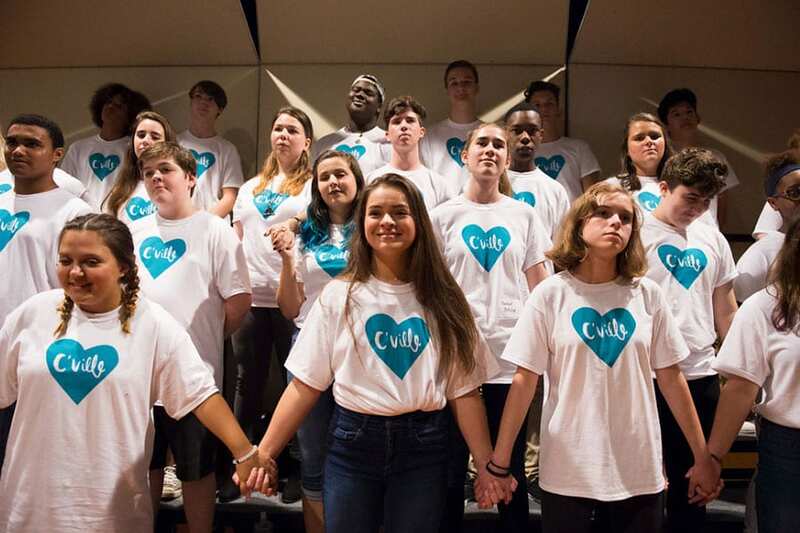 In the wake of the deadly events of August 11-12, 2017, a group of five Metro Nashville Schools students wanted to show their love and support for the Charlottesville community. 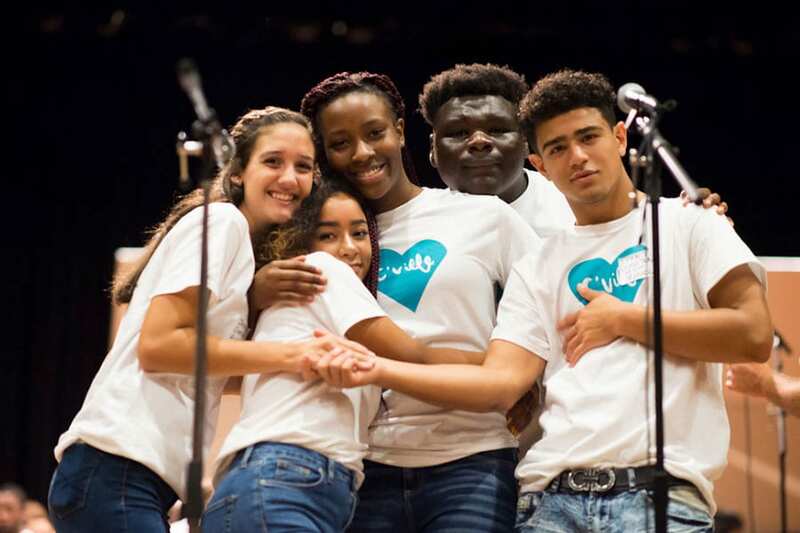 With the assistance of Pearl-Cohn Magnet High School music teacher Cedric Caldwell, students recorded a version of entertainer BeBe Winan’s song “Right Now (We Need One Another)” and put together a heartwarming video message that was emailed to teachers at Charlottesville High School. The song of encouragement was well-received by the school and ultimately caught the attention of Laura Thomas, the school’s orchestra director. 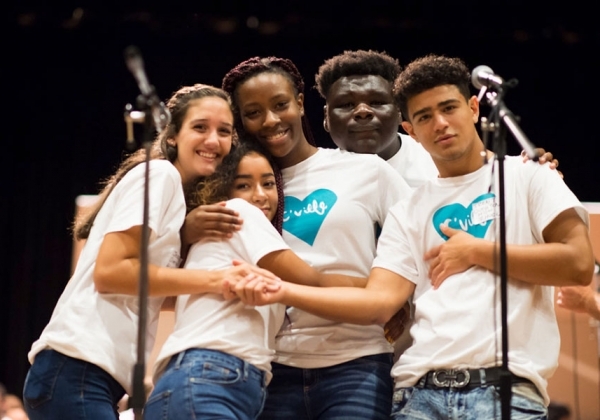 Under the direction of Thomas and the CHS choir director Will Cooke, the school’s orchestra and choir learned “Right Now (We Need One Another)” and invited the “Fab Five” of Metro Nashville Schools students to Charlottesville. 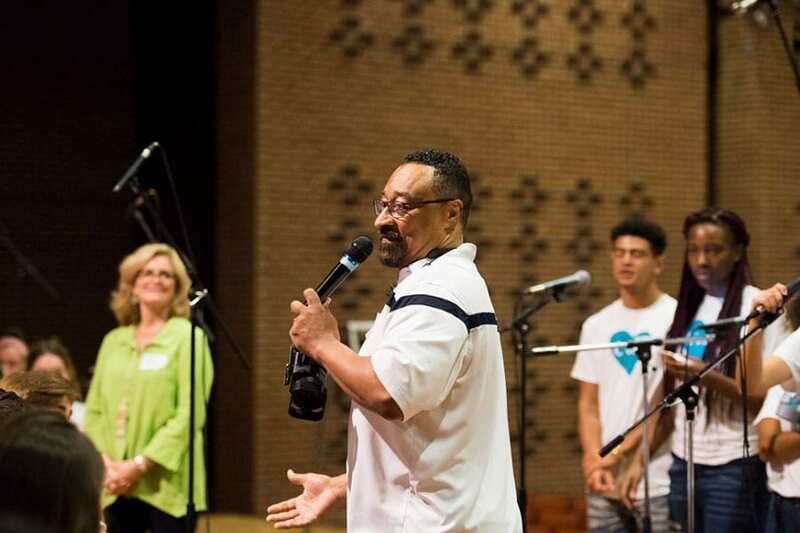 Recognizing the need for racial reconciliation and healing, Charlottesville City Schools administrators helped bring the Metro Nashville students to Charlottesville. 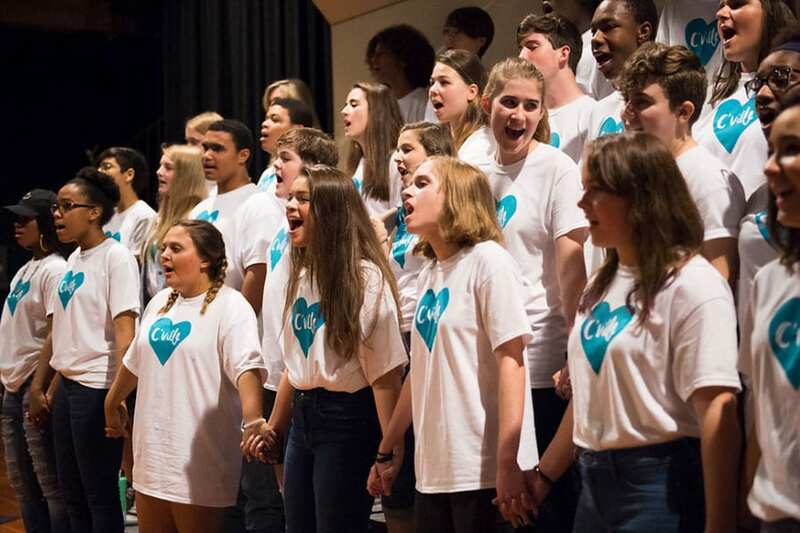 On Friday, September 15, wearing white T-shirts emblazoned with a heart and the word “C-ville,” the two groups of students came together to perform the song at a school-wide assembly at Charlottesville High School. The following day, the students performed at various locations around the city, including the street where Heather Heyer lost her life. Video footage of the collaboration was expertly assembled by parent volunteer Lori Shinseki, and it was shared with the community via social media. Nine days later, the video of the combined performance was broadcast on jumbotron as part of the Concert For Charlottesville featuring major headlining musicians such as Dave Matthews, Pharrell Williams and Stevie Wonder. The concert, which was held at University of Virginia’s Scott Stadium, was attended by over 50,000 people and live-streamed on such platforms as Facebook, YouTube, Tumblr and HuffPost. The collaboration created immeasurable positive feeling and healing within our school communities, our local communities, and beyond. It even led to a follow-up gathering to record a second song in support of the Parkland, Florida survivors. Scheduling Logistics – recognizing the need for healing CCS administrators allowed student performers to adjust class schedules allowing for the needed rehearsal time and provided time for the all-school assembly. Funding sources – Charlottesville High School Orchestra is well funded by both the school division and the community at large. Those associated with the organization solicited donations. Parents, teachers, administrators and others contributed. Expenses from the project were later reimbursed by the Concert for Charlottesville Fund benefiting victims of the events in Charlottesville on August 11-12, 2017, their families, first responders, and organizations dedicated to the promotion of healing within the city of Charlottesville. I don’t know how you measure the healing that occurs after a fatal and traumatic event – an event that not only impacted the local community but also shocked the nation. However, it is clear to me, after experiencing this project, the profound power of music to bring people together. Below are measurable events that happened as a result of this project. Building bridges between schools and communities starts with identifying what we already share. 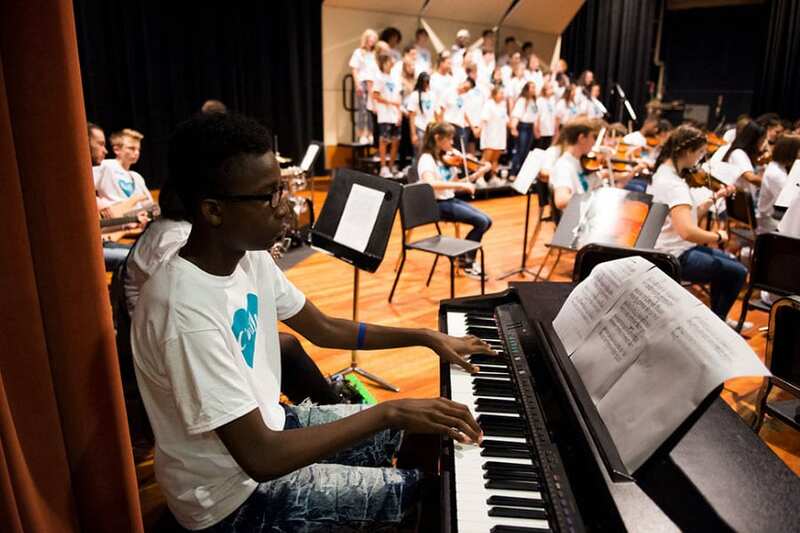 Students in a Virginia choir and orchestra were eager to collaborate with students in a Tennessee choir because we all speak the same musical language; we share the culture of rehearsals, practice, and performance. The students in Nashville recorded a video for us, we responded with an invitation, and the resulting collaboration was awe-inspiring for our students, teachers, and community!